The interPLAY Orchestra has over 67 talented orchestra members. This includes a group of dedicated “Bandaides”, musicians, professional performers and behind the scenes skilled staff for concerts and rehearsals. The Orchestra members include adults with and without cognitive and physical disabilities. Orchestra members play professional percussion and traditional instruments from all over the world. Orchestra members also perform vocals. The Orchestra is a 501 (c)(3) nonprofit organization and its board of directors meets six times a year at the Music Center at Strathmore. All donations are tax deductible; click here to donate online. 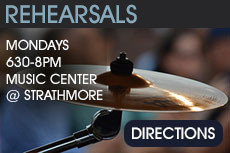 The Orchestra is fortunate to rehearse and perform at The Music Center at Strathmore in North Bethesda, Maryland, one of its highly creative education partners. Click here to learn more about the staff and board of directors that make up The interPLAY Orchestra. Article with photos and audio of Orchestra members talking about their experiences with the Orchestra.